Discreet hand-held microphone for use in standard radio communication or surveillance with 2-way radio. Used with a Convertible earpiece or Communicate EarTM in noise. We can fit almost any radio with a Palm Microphone we just need to know the make and model of the radio. 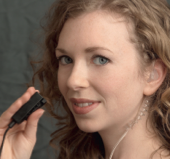 The Palm Microphone has a jack that allows incoming audio to be transmitted to either a speaker button on a Communicate Ear dB BlockerTM or through our Ultralite to either a Filtered Covert or Convertible Y Vented dB BlockerTM earpiece. Your radio connects directly to this earpiece eliminating missed calls. The additional Y vent lets you hear people and things around you while connected to your radio. dB BlockerTM is a new generation of protection completely effective in blocking out the decibel levels that can cause hearing damage. They use proprietary filters to “squeeze” high and low frequencies to block potentially harmful sound waves. Communication comes through, noise does not. An excellent product to take radio communication directly to the ear. This minute over-the-ear communication cord set provides clear, reliable sound. It optimizes discretion for surveillance while maximizing clarity. Ideal for moderate noise situations where rugged, reliable communications are required. UltraLite is highly recommended for general policing, security, emergency response teams, light industrial applications, and anywhere dependable response is necessary between communicators. Connects with either a 2.5mm or 3.5mm right angle jack into a speaker microphone or radio output jack. 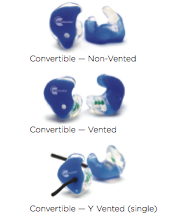 Uses either a Filtered Covert or the Convertible-Y Vented earpiece below. Length 22″ relaxed and 32″ extended. Moderate noise is noise below 100dB. For 2-way radio communication in high noise environments. It has a 19dB noise canceling Boom Microphone that decreases background noise to clarify outgoing communication in noise. When used with Convertible-Y Vented dB BlockersTM, incoming communication is clear, and distinguishable. Comes with an in-line Push To Talk (PTT) switch. Can be ordered for a remote PTT switch for almost hands-free operation. We will need to know the model number of your radio, to provide the correct headset.